Adventures in the Modern Lounge is a romp through the musical genre, Lounge Music, which is really a musical background soundscape. Whether we are referring to music played in saloons/ speakeasies/ cocktail lounges, or easy listening music from the 50’s and 60’s(the alternate choice over Rock & Roll) or todays Lounge Music or ”Chill” which is a sonic brake from the hard driving dance music in the clubs, it’s all Lounge Music. This is music to join you during your “quiet time” at the end of the day or to be the sounds at your next cocktail party. Dig the Latin beats and percussion instruments that pulsate throughout. Float amongst the B3 organ, vibraphone or Fender Rhodes chordal progressions that lay the foundation of each ditty. And of course, feel the love in the sax melodies. This is your soundtrack for the modern retro lifestyle. “Welcome, you’ve found the spot”. Give it a try at CDBaby. Not one to be quiet about making an entrance, producer/keyboardist Nate Harasim‘s Trippin N’ Rhythm label debut, is one sure to place him firmly in the new class and crop of emerging talent, highlighted by a cameo vocal performance from young Maxine Hardcastle daughter of mega-hit maker Paul Hardcastle. With Harasim’s recent 30 minute performance showcase on Fox news Detroit, writing and producing the theme song for the 2010 American Smooth Jazz Awards and coming off an 8 week run at #1 on the National radio charts with ‘Fun In The Sun,’ a track he produced for guitarist Steve Oliver, the media and radio in unison, have taken notice of his burgeoning talent. Rush highlights the many sides of a young man with a keen ear, serious chops, strong pop sensibilities and displays his break out of the box mentality and his willingness to the push the envelope. With assists from label mates Cindy Bradley and Darren Rahn and a payback from Steve Oliver, Rush is a soulful, fresh and funky ride through 11 sparkling sides, yet one that as the title suggests, you won’t want to rush through but take your time to savor the journey. Rush is scheduled for release February 1, 2011, enough time for your advance order. Aleks Di Roma (Aleksandr Romanenko) is a Ukrainian-born guitarist, singer, and songwriter. His dynamic performances and recorded compositions always cover a wide range of provocative melodies including both instrumental and vocal forms, with true passion laying in rich and radiant sounds of Spanish and Jazz Guitar. His debut album Horizon Of Harmony covers a wide range of provocative rhythms and melodies, including both instrumental and vocal forms, with true passion laying in rich and radiant sounds of Spanish and Jazz Guitar. His CD just arrived at CDBaby. Although known for his cooperation with jazz saxophonist Ronnie Laws, singer Randy Crawford and trumpet player Rick Braun Craig Sharmat earned his merits mainly as composer of trailers for movies like King Kong, Ghost Rider, Eragon, Anchorman, and songs for the TV series like CSI Miami, Without A Trace and many more. Last year he started his solo career as a guitarist with his album So Cal Drivin receiving rave reviews of many Internet critics. The single of this album was in the Billboard charts for seventeen weeks. 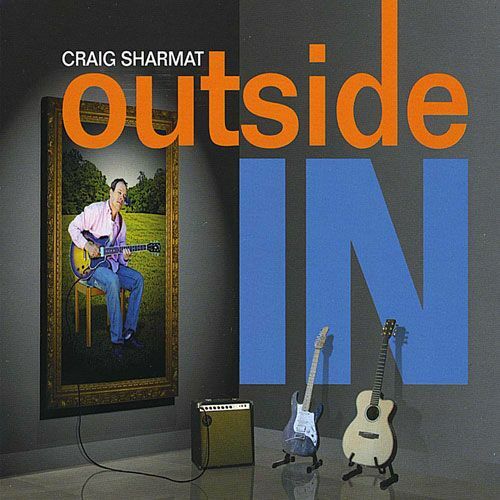 With his new album Outside In Craig offers proof for the persistence of his innovative career. Craig assembled on his new project prominent musicians like Rick Braun, Rayford Griffin, Gregg Karukas, Phillipe Saisse, Luis Conte, Greg Matheison, Dan Lutz, Nate Najar, Mark Hollingsworth and many more. With the orchestral introduction of Bossa Newva Craig showcases his heritage as film composer, but his affinity for seductive melodies is stronger, just for this time. While the jazz guitar follows the melody line, the song is brilliant with a fine arrangement of horns and strings. Kenneth Whalum III has been surrounded by a versatile musical community which has included rising stars such as Robert Glasper, Bilal, and Brad Mehldau, Sean “P Diddy” Combs, Beyonce, Fantasia, Joss Stone, and R&B producer Rodney Jerkins among others. More recently, he has toured across the world with R&B crooner Maxwell, playing in sold-out arenas, concert halls, and benefit concerts. Do you need more recommendation? Soul is a phenomenally successful instrumentalist who is on the verge of changing instrumental music as we hear it today. Soul’s sound has been a staple on adult contemporary and smooth jazz audiences, making him a household name. Soul is a fine player with an attractive sound (influenced by Kenny G) that often caresses melodies, putting a lot of emotion into his solos. Because he does not improvise much (sticking mostly to predictable melody statements), his music largely falls outside of Jazz and into Soul/R&B. However, since he is a saxophonist, he is classified as Jazz. Chris Mitchell started performing with professionals such as Kyle Turner and Dean James in 2005. He recorded the record “We Are One” with R&B artist Joseph Washington and freelanced locally. After graduating from Sam Houston State University, Soul worked with producer Kash, making the single “Universoul”. Soon he was heard by the Red Cat Jazz Cafe and began his Monday night shows in 2009. He was in demand for guest appearances at Midtown Lounge, Clayton’s Restaurant & Bar, Urban Soul Lounge, and House of Blues. Soul’s performances have sold remarkably well, particularly at the Red Cat Jazz Cafe, which became a familiar Monday show to Houston. The single “Universoul”, released in 2005, reached many listeners in the South Central, Mid-West regions, and birthed a large following of fans. Soul can be seen at many live music locations in Houston. Want R&B, Soul, and Jazz music? Soul is a must to book. “I thank God for all my blessings”, says Soul. There is a difference between talent and a gift; talent is a skill that is learned, a gift is a skill from God, and without a doubt Soul is gifted! Are you curious? Then check his CD at CDBaby. Audie Smith is the leader of his on group call Prime Cut. Prime Cut has released their own CD, call “Time for a Change”. Audie Smith Composed all of the songs for that C D, as well as this one. Audie Smith is known for playing at his parent’s restaurant, Marmalade Restaurant, as well as Folks Folly and a variety of establishments around the Memphis TN area. Audie also spent 6 years performing around New York with local acts, opening for performers such as Roy Ayers and the Main Ingredients. The on this CD is “feel good music”. Sincerely Yours is your premium choice at CDBaby.